YANGON, Myanmar — As Aung San Suu Kyi launched a national struggle against decades of harsh military rule, one medical student worked tirelessly at her side, facing down gun-wielding soldiers trying to crush the surging pro-democracy movement. For her activism and loyalty, Ma Thida suffered six years of mostly solitary imprisonment and nearly died of illnesses. The criticism by Ma Thida and other formerly ardent supporters is manifold: they accuse Suu Kyi of ignoring state violence against ethnic minorities and Muslims, continuing to jail journalists and activists, cowing to Myanmar’s still-powerful generals, and failing to nurture democratic leaders who could step in when she, now 72, exits the scene. Instead, they say her government is creating a power vacuum that could be filled again by the military. Some conclude that Suu Kyi, who espoused democracy with such passion, always possessed an authoritarian streak which only emerged once she gained power. “We can’t expect her to change the whole country in one-and-a-half years, but we expect a strong human rights-based approach,” Ma Thida says of the Nobel Peace Prize winner once hailed as “Myanmar’s Joan of Arc” and spoken of in the same breath as South Africa’s Nelson Mandela and Mahatma Gandhi of India. International criticism has focused on Suu Kyi’s lack of action or condemnation of violence targeting the country’s approximately 1 million Rohingya Muslims, who have been brutalized since 2012 by security forces and zealots among the Buddhist majority in western Myanmar. More than 1,000 Rohingya have been killed, while some 320,000 are living in squalid camps in Myanmar and neighboring Bangladesh, according to estimates by the U.S.-based Human Rights Watch and the United Nations. Thousands more embarked on perilous sea voyages to other Southeast Asian countries. “We don’t have a second choice. People still support her party and government. People must lower their expectations because the problems are so deeply rooted,” says Thant Thaw Kaung, executive director of the Myanmar Book Aid and Preservation Foundation, an initiative to improve the country’s woeful education system. For years, Suu Kyi had courageously defied the military, suffering 15 years of house arrest and separation from her British husband and two sons to helm her National League for Democracy to a landslide victory in 2015 elections. Often referred to as “The Lady,” she retains popularity among the general public as the liberator from half a century of military oppression. “When she was in the opposition she was so articulate, so vocal, but suddenly now we are faced with silence. Now that Myanmar is back on the democratic path, everyone expects that there should be more openness, but this has not happened,” says Khin Zaw Win, a political prisoner for 11 years who now heads the Tampadipa Institute, a civil society think tank. 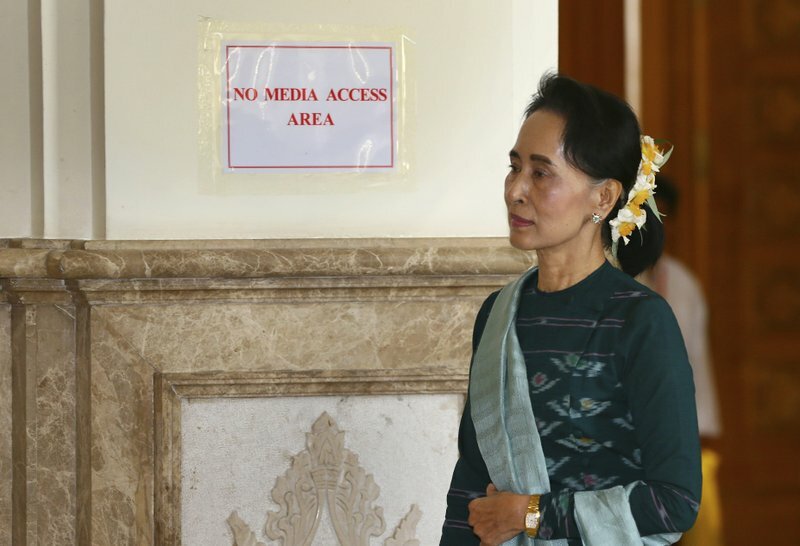 Since assuming office in April 2016, Suu Kyi has earned a reputation for being aloof and controlling of information. Explanations for why she’s changed, or faltered in upholding previously avowed goals, are starkly disparate: she is variously cast as a tragic heroine fighting impossible odds, and a closet authoritarian with a soft spot for the military. Suu Kyi herself has often said she inherited an affinity for the armed forces from her father Gen. Aung San, a military hero who fought for independence from Britain. Perhaps the most widespread view is that she simply can’t push her democratic agenda or human rights demands, lest the military oust her from power. Although her post as government leader places her above the president, the military retains its grip on three key ministries controlling law enforcement, local administration and embattled frontier areas as well as a mandated 25 percent of seats in Parliament. “She may shake hands with the military across a table, but under it they are kicking her,” says That Thaw Kaung. Some disagree, and say her popular mandate gives her the force to challenge the generals who are unlikely to upset an arrangement that still allows them to wield power with seeming impunity while also being able to blame problems on Suu Kyi’s civilian government. “The litany, the excuse that is repeated, ‘Oh, the military is still in politics, still dominates the Constitution ... so we are hamstrung.’ I don’t buy that argument,” says Khin Zaw Win. “She is not a prisoner of the military.” What is lacking, he says, is moral courage in addressing human rights and the ability to tackle other problems outside the power grid of the military, such as the economy. Meanwhile, the military is preparing itself for the 2020 elections. Mark Farmaner of the human rights group Burma Campaign UK says that while Suu Kyi may be constrained by the political situation, there are many areas where she has the freedom to act and has not done so. “There are problems which will take years to resolve, but freeing political prisoners, repealing repressive laws and ending aid restrictions to displaced Rohingya can be done now,” he says. The Assistance Association for Political Prisoners reported that 225 persons were still in prison or awaiting trial last month for political activities. Suu Kyi has often stressed that her highest priority is ending decades of warfare between the central government and a welter of ethnic minorities. Last week, her government welcomed a report from a commission led by former U.N. Secretary-General Kofi Annan recommending rapid economic development and social justice to counter the deadly violence between Buddhists and Rohingya Muslims in Rakhine state. But Suu Kyi has also publicly ignored the army’s continuing attacks and atrocities against ethnic groups in the Kachin and Shan states, further eroding their trust in her government. “Her concept of national reconciliation seems to focus mostly on the relationship between the military and her party, with the ethnic minorities being an inconvenient side-issue,” says Ashley South, an expert on Myanmar’s ethnic minorities. Farmaner contends Suu Kyi views Myanmar principally as a country of the ethnic Burman Buddhist majority, rather than a multi-ethnic, multi-religious nation. Some critics say Suu Kyi is trapped not by the generals, but by her own history and that of Myanmar, which has endured centuries of kings, British colonials and military dictators. By contrast, the country has experienced a mere 15 years of democracy. Suu Kyi has expelled dissident party members, neglected to groom successors, spoken rarely to the press and apparently made command decisions rather than seeking help from capable advisers. “She seems to be following almost exactly in his footsteps,” he says. “I call it the ‘courtier mentality’ and that is exactly what is happening now.” Having reached the pinnacle of power, he says, Suu Kyi believes she can go it alone.